BEIRUT/AMMAN • Big-power tensions in the Syria conflict, already running high after an apparent chemical weapons attack, ratcheted up as Syria and Russia blamed Israel for air strikes on a Syrian military base that a conflict-monitoring group said had killed 14 people, including fighters from Iran. The strikes came a day after United States President Donald Trump called Syrian President Bashar al-Assad an "animal", and warned him and his Russian and Iranian backers that they would have a "big price to pay" after dozens of people were killed last Saturday near Damascus, in what rescue workers said was a chemical attack. Israel, which has struck Syrian army locations many times in the course of its neighbour's seven-year-old civil war, has not confirmed nor denied mounting the raid yesterday. But Israeli officials said the Tiyas, or T-4, airbase was being used by troops from Iran, and that Israel would not accept such a presence in Syria by its arch foe. The Syrian Observatory for Human Rights, a British-based monitor, said at least 14 people were killed, including fighters of various nationalities, a reference to Iranian-backed Shi'ite militia members, mostly from Iraq, Lebanon and Iran, fighting alongside the Syrian army. 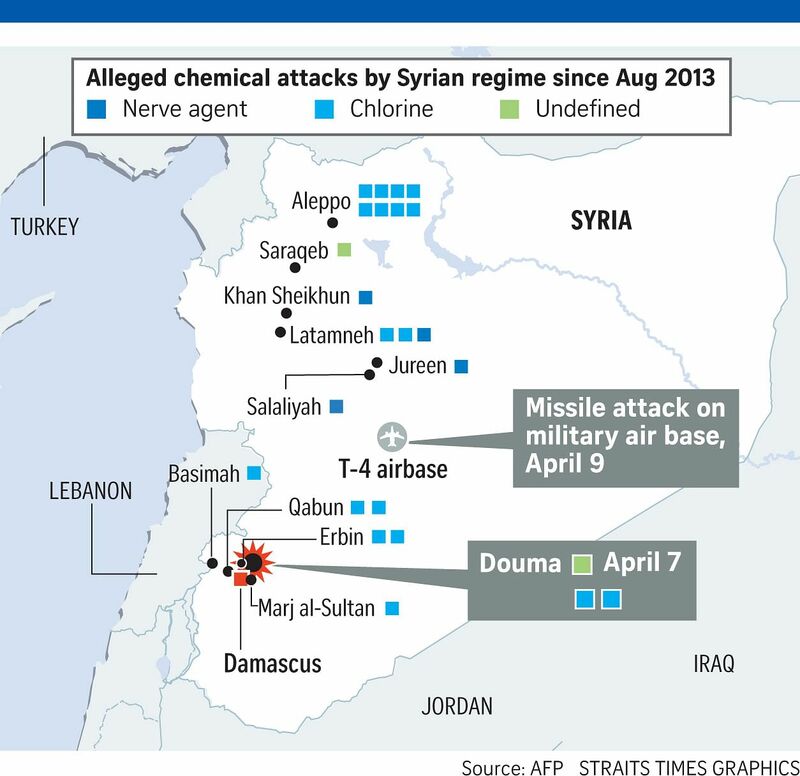 The attack demonstrated the multi-faceted nature of the Syria conflict, which started in March 2011 as an uprising against Mr Assad and now involves several countries and various insurgent groups in a web of alliances. Mr Trump had warned of a "big price to pay" following the reports of a poison gas attack on the Syrian town of Douma which killed dozens of people, including children. Mr Trump also criticised Russia and Iran for backing Mr Assad, directly naming Russian President Vladimir Putin. US Defence Secretary James Mattis yesterday pointed towards Russia's role, and said he would not rule out a military response. Damascus denied its forces had launched any chemical assault, and Russian Foreign Minister Sergei Lavrov said such allegations were false and a provocation. Mr Lavrov also said the strike on the T-4 base was a dangerous development. Syrian state TV initially said the US was suspected of carrying out the attack on T-4. Washington denied this, and France, which in February had said it would strike in the event of a chemical weapons attack on civilians by Syrian government forces, also said its forces were not involved. The Russian military, whose support for Mr Assad has turned the war in his favour, said two Israeli F-15 war planes carried out the strike. Interfax news agency cited the Russian Defence Ministry as saying Syrian air defence systems had shot down five of eight missiles fired. Syrian state media, citing a military source, carried a similar report. Israel has accused Damascus of allowing Iran to set up a complex at the T-4 base to supply arms to its ally, Lebanon's Hizbollah, and in the past, its forces have hit convoys and bases of Iranian-backed militias that fight alongside Mr Assad's troops. Defence analysts say a number of Russian troops are also based there, and jets fly regular sorties from T-4. Israeli Housing Minister Yoav Galant, while not confirming that Israel had carried out the attack, said: "We would not allow Syrian land to be a springboard for game-changing weaponry to Lebanon, we would not allow the building of an Iranian army in Syria and we would not allow the opening of another front on the Golan Heights. In this context, we are taking action with all means, over time."